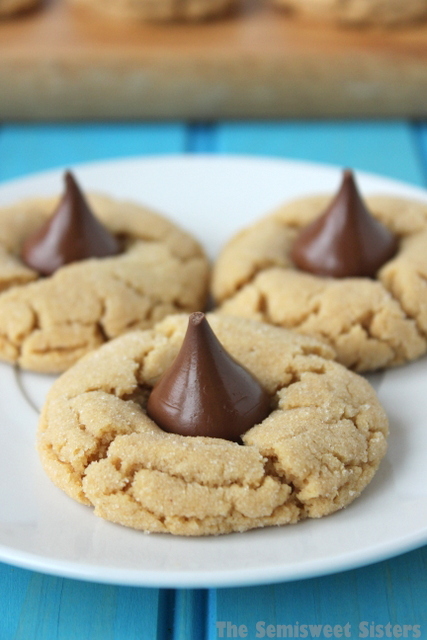 Peanut Butter Cookies rolled in sugar & topped with a Hershey’s Kiss. It’s been a rough week for my sister & I. Our Grandma has been in the hospital & we are all praying that she makes a speedy recovery. She’s the last grandparent we have left. I wanted to post this recipe last week but with everything that’s been going on & all the time I’ve spent at the hospital it just didn’t happen. 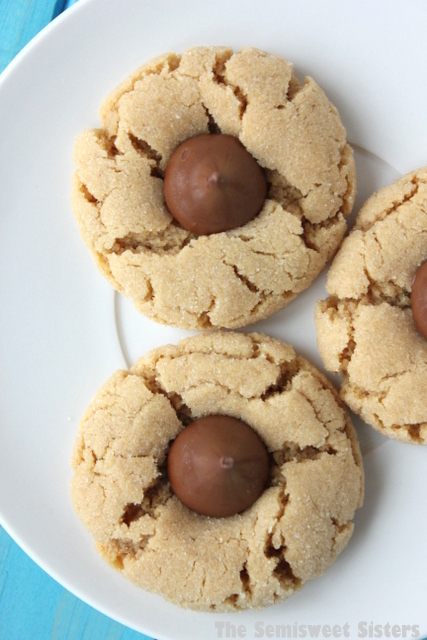 This recipe for Peanut Butter Blossoms is one of my all time favorite cookie recipes, my families been making it for as long as I can remember. I got this recipe from my aunt many years ago. She used to make them all the time when I was a kid. You will find this recipe is different from the one on the back of a Hershey’s Kiss bag. I don’t think I’ve ever made that version because this has been my go-to recipe for so long. Chocolate & peanut butter go so well together don’t they? I love eating these cookies while they are still warm from the oven because the chocolate Hershey’s Kiss on top is still all melty & gooey. These cookies are pretty addicting, I find it hard to stop after eating just one. Scoop or roll dough into 1 inch balls (or smaller). Roll balls in a bowl of sugar to coat. Place on ungreased cookie sheets. Bake for 8-10 minutes. While the cookies are baking unwrap the Hershey's Kisses. Right after you remove the cookies from the oven place a Hershey's Kiss on top of the cookie & gently press it down. This recipe makes on average 32-38 cookies, depending on how small you make them. My thoughts and prayers are with your family! As someone who has lost all grandparents, I know how tough it can be when going through these situations. What truly helped me was being with family :-) These cookies look delicious, by the way, and I hope all continues to go well for your grandma’s recover! Thank you so much Michelle I really appreciate your kind words! These cookies is very yummy and delicious, thank you I really like it! God Bless You all!!! I don’t have vanilla extract , can I use banana extract? Any thoughts? Hi there! You can omit the vanilla extract, it is not necessary. The peanut butter is where the real flavor is at! Hope you enjoy them, thanks! How long can I freeze these for? Hi Keturah, Cookies can usually be frozen for up to 3 months in an air tight container. I usually don’t freeze my cookies more then 1-2 weeks though.